An order by Federal Judge Robert Lasnik appeared to give hope for reducing a new threat of gun violence. He blocked the public availability of blueprints that provide instructions for making plastic guns using 3-D printers, only hours before the documents were expected to be published on line. These do-it-yourself weapons would empower anyone - even criminals with court orders blocking their ability to buy guns - to get them. New York Attorney General Barbara Underwood asserted, "As we argued in the suit we filed yesterday, it is - simply - crazy to give criminals the tools to build untraceable, undetectable 3-D printed guns at the touch of a button." In fact, the Attorneys General of 21 states and the District of Columbia filed a joint lawsuit to force the Trump Administration to prevent inventor Cody Wilson from ushering in what his website calls "the age of the downloadable gun." Faced with dire warnings about an imminent risk for public safety from alarmed public officials from across America, Seattle Judge Robert Lasnik of the U.S. District Court said the lawyers bringing the suit had established "a likelihood of irreparable harm." 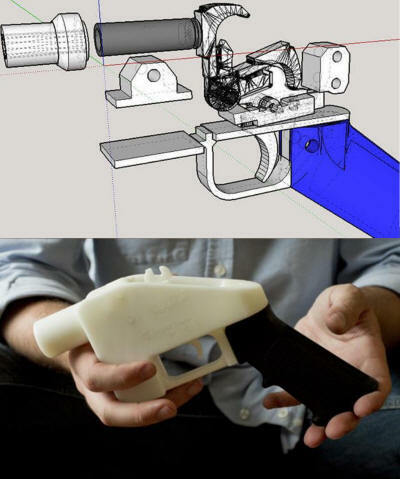 However, Cody Wilson, the founder of Defense Distributed, which made the first fully 3-D-printed pistol and posted the design files online, sued the Federal Government. Shocking all who were involved, on June 29 the Federal Government reversed its earlier opposition to Wilson, and agreed to pay him $40,000 in legal fees, and exempted the company from the regulations, allowing it to post the blueprint online. That's what sparked 21 state Attorneys General to write to Secretary of State Mike Pompeo and Attorney General Jeff Sessions asking the Federal Government to withdraw from the settlement and block plans from going online. Federal Judge Robert Lasnik decision on June 30 reversed the Federal Government's action with a temporary restraining order. New York Gov. Andrew Cuomo also issued a cease-and-desist order against Wilson who was scheduled to post them on line. Cuomo said, "In a major victory for common sense and public safety, a federal judge just granted our request for a nationwide temporary restraining order - blocking the Trump Administration from allowing the distribution of materials to easily 3-D print guns." Wilson's attorney, Josh Blackman, compared the case to the Pentagon Papers case, in which the Supreme Court famously rejected the government's attempts to block news organizations from publishing a secret history of the Vietnam War. "This is a huge free speech case," charged Blackman, who vowed to continue fighting the efforts to prevent Wilson from posting his documents online. Critics note that the homemade firearms produced by Wilson's schematic can be printed without serial numbers or government registration. They say the firearms - known as "ghost guns" - would allow criminals and terrorists to evade detection. President Trump appeared to be surprised by the green light his Federal Government gave to Wilson. He tweeted that he was "looking into" his Administration's decision. "Already spoke to NRA, doesn't seem to make much sense," he wrote. Later a spokesman for the President insisted that the President is committed to the "safety and security of all Americans." Alarmed Senate Democrats declared that Trump would be responsible for any injuries or deaths resulting from untraceable 3-D plastic guns, and called on him to reverse the policy immediately. "It's his doing, it's his responsibility and the blood is going to be on his hands," said Connecticut Sen. Richard Blumenthal. "He can tweet from now until the end of his administration, but the hard reality is that he can stop needless death and injury in America." The stakes are high for everyone. On an average day 96 Americans are killed with guns. There were nearly 15,000 gun homicides in 2016 - and nearly 23,000 suicides. These figures are 25 times the average of other high-income countries! However, between 1994 and 2014 federal, state and local governments conducted background checks on more than 180 million firearm applications, and blocked over 3 million gun sales to prohibited purchasers. If Wilson's proposal becomes law, background checks would disappear and death rates would rise. The advent of 3-D printers, the cheapest of which can be bought for a few hundred dollars makes possible the creation of functioning weapons at low cost. I pray that the temporary restraining order of Judge Robert Lasnik becomes permanent.